Two states emerged about a century after the fall of the 3rd Dynasty of Ur between Rivers Euphrates and Tigris: Babylonia in southern Mesopotamia and Assyria in northern Mesopotamia. The period following Neo-Sumerian Period is commonly referred as Old Babylonian Period for the history of southern Mesopotamia and Old Assyrian Period for the history of northern Mesopotamia. Old Babylonian Period starts with the emergence of the first Amorite dynasty - the dynasty of Larsa which was founded by Gungudum about 1932 BC. The 1st Babylonian Dynasty with its capital city of Babylon controlling only small surrounding territory was founded about the same time. The Old Babylonian Period reached its height under Hammurabi (c. 1792 - c.1750 BC) who established a powerful empire reaching far beyond the borders of Mesopotamia: from the Persian Sea to the territory of today’s Turkey and from the Zargos Mountains on the east to the Mediterranean Sea on the west. Hammurabi made Babylonian Empire a major power but he is probably best known for his law code - the Code of Hammurabi which had great influence on legal history including the Ten Commandments. 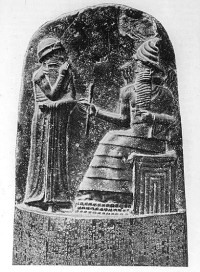 Hammurabi’s empire began to decline already under his son and successor Samsuiluna. Babylon was invaded by the Hittites under leadership of Mursili I in 1535 BC, while the Hittite invasion was taken advantage by the Kassites, people from Iranian plateau who subdued Babylon about 1532 BC. The city of Assur (also spelled Ashur), predecessor of Assyria emerged in northern area of Mesopotamia as an important trade center with trade colonies in Anatolia at the time when the city-states in southern Mesopotamia struggled for supremacy in the 19th century BC. In 1813 BC, Assur was conquered by Shamshi-Adad I who extended its territory on great part of Syria and Iranian plateau on the east and to Babylon on the south. His territorial gains were lost shortly after his death about 1781 BC, while the region became inferior to Babylonian Empire under Hammurabi. The history of Assur and northern Mesopotamia remains mostly unknown until 1500 BC when it became a vassal state of the Hurrian kingdom Mittani.